So I wrote a book. That book is one I'm very proud of. 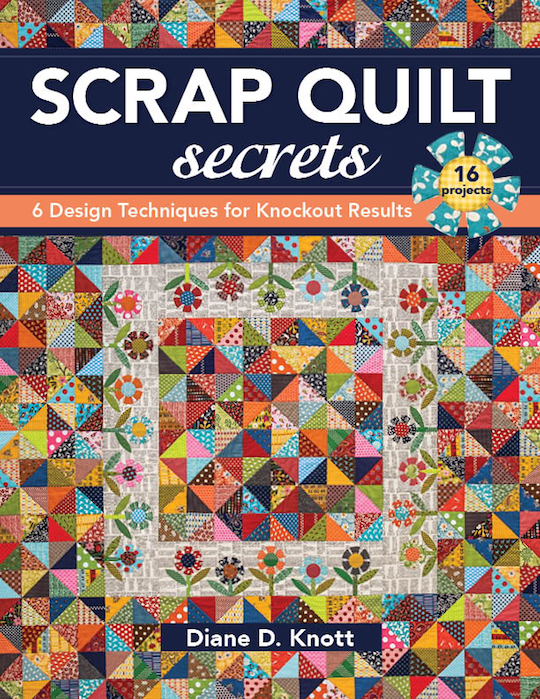 I've gotten the kindest feedback and wonderful reviews for SCRAP QUILT SECRETS. Style tells the story of your quilt. Contrast does all the work and color gets all the credit. Repetition creates a calm design from chaos. Accents of color can really make a design succeed. Palettes or ranges of color options can make the very best scrap quilts. And once again, while I was traveling and teaching, I noticed that I was hearing a set of new questions. While I was exploring the design process with my fellow quilters, I noticed they were super curious about some of my organization methods and sewing techniques. So I wrote another book. STRIP QUILT SECRETS reveals the storage and organization methods I use to manage my stash. It also explains in detail the techniques I use for not only storing my scraps, but how I sew with them and how I achieve accuracy through the cutting, sewing and pressing process. Strip sets that combine lots of fabrics and make accurate blocks. Triangles from strips are a great way to achieve no waste units that need no trimming! Resewing strip set that have been cut and turned for spinning success. Individual strips can be sewn without fuss and with lots of fun! Piecing alternatives which include sew and flip techniques and sewing scraps into strips. And of course I had to toss a selvage quilt into the book as well. While both books are organized the same way, and they both have acronyms for the chapters, and they are both filled with quilts I love and adore, they are very different as well. Some of the quilts in the first book can be strip pieced, and they do use some triangles, the new book is all about STRIPS. It has lots of techniques, but loads of tips and hints as well. And the thing I'm most excited about STRIP QUILT SECRETS? Every quilt is available in four different sizes! That's right, no more doing math for everyone who asks, it's all there in the book already. You can make any quilt in the book in any size! Woohoo! And you will be able to order my new book in just one month! If you haven't already pre-ordered it online, you will be able to get it from me in person or in my shop beginning Nov. 23. So you can start your Black Friday shopping right here! I will have a package deal for ordering both books at the same time, and I will be offering other prizes and give aways to celebrate! That is so exciting! I'm sure it will be a smashing success!